If you love paintings, then this is the tour for you! We tour the Accademia Art Gallery and the new wing. 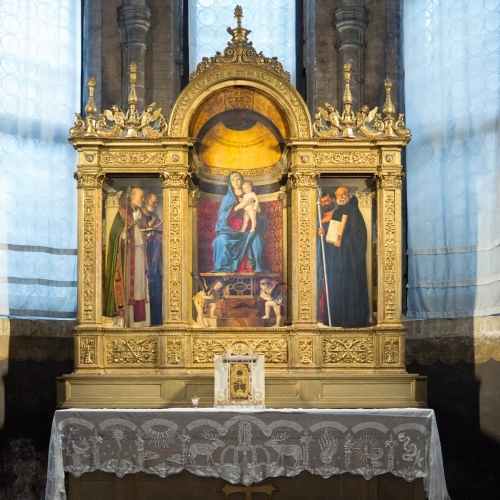 This impressive, matchless collection will unveil the spirit of Venetian paintings from the very beginnings in the 14th C. up to the 18th C. in a great location, a former monastery and a former lay confraternity. We admire in this comprehensive museum the great masterpieces of Venetian art from Paolo Veneziano to Bellini’s Madonnas, Giorgione (The Tempest), Titian (Pieta’), Tintoretto (The Miracle of the Slave), Veronese (Last Supper) and up to Tiepolo, arranged more or less in a chronological order. We will thus understand in the depth of this art tour the evolution of painting techniques, vibrant colours, materials and religious themes over the centuries. 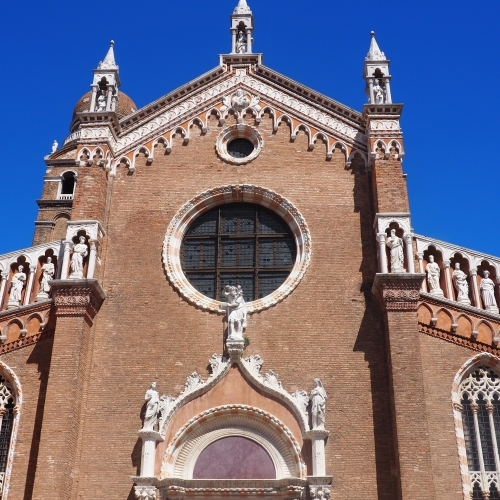 We begin our walk from the busy and crowded Rialto area, the ancient hub of Venice, and through the bustling fish, fruit and vegetable market we reach the ‘glorious’ Frari Church in the quieter part of the district of San Polo. Built in the Gothic style by poor Franciscan monks this massive church contains a number of unequalled masterpieces among which Bellini’s stunning tryptic Pala Pesaro in the sacristy and Titian’s outstanding brilliant Assumption on the main altar. 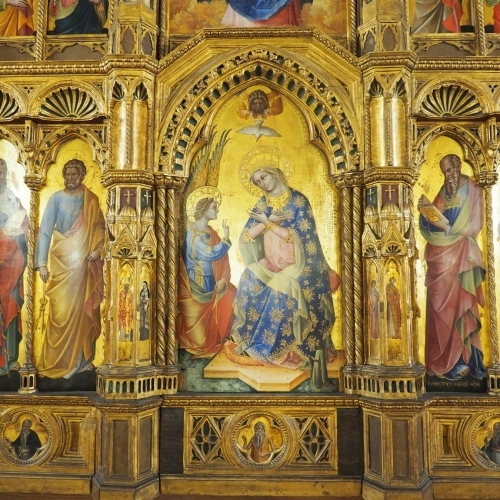 These paintings, still in their original positions and frames, will thus allow us a first detailed introduction to Venetian Early Renaissance paintings. We will also follow the historic evolution of the concept of death in many Venetian tombs. 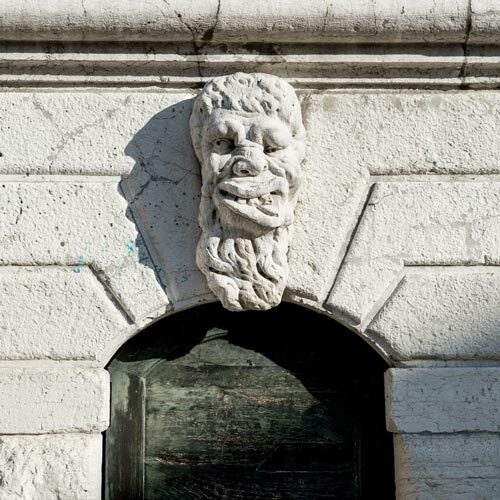 We start our tour from the busy and crowded Rialto area, the ancient hub of Venice, and through the bustling fish, fruit and vegetable market we arrive at the extraordinary Brotherhood of Saint Roch (Scuola di San Rocco) in the tranquil part of the district of San Polo. This still existing and active confraternity of laymen is entirely decorated with unexpected, wonderful paintings by Jacopo Tintoretto and wooden allegorical sculptures by Francesco Pianta. Among the unforgettable and spectacular canvases painted by Tintoretto with religious subjects from the Old and New Testament The Crucifixion in the sumptuous Albergo room is a must. His cycle of paintings unveils in a fully comprehensive way the spirit of late Renaissance in Venice. We meet by the impressive Baroque Salute Church and walk along the sunny Zattere quay – Venetians also enjoy walking along here or jogging in Spring and Summer – to the charming gondola yard by San Trovaso up to the Renaissance San Sebastiano Church in a quiet area of the district of Dorsoduro. Behind a very modest facade you will be stunned by a unique pictorial cycle by a young Paolo Veronese, who is also buried here. From there we then walk over to the lively Campo Santa Margherita with its Gothic palaces, plane trees, in the mornings with a bustling fish market, in the afternoons kids playing around. We then continue to the campo San Barnaba used as a location for many films such as Summertime and Indiana Jones and the last Crusade. 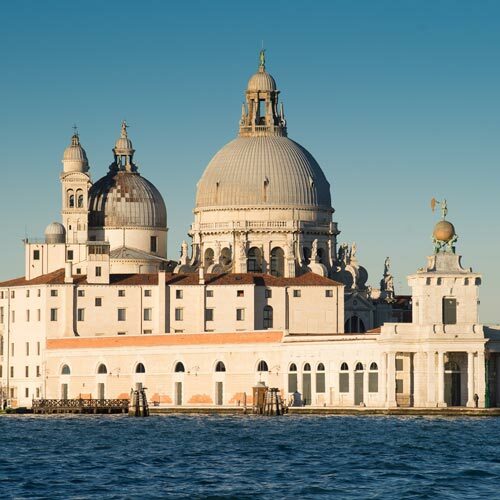 We meet by the impressive Baroque Salute Church and walk along the sunny Zattere quay – Venetians also enjoy walking along here or jogging in Spring and Summer – to the charming gondola yard by San Trovaso in a peaceful area of the district of Dorsoduro up to the Scuola dei Carmini. This former lay confraternity displays in the upper hall bright paintings by Giambattista Tiepolo; this unique delightful cycle well represents the spirit of the Settecento, the 18th C. in Venice. When stepping out we walk over to the lively Campo Santa Margherita with its Gothic palaces, plane trees, in the mornings with a bustling fish market, in the afternoon kids playing around. We then continue to the campo San Barnaba used as a location for many films such as Summertime and Indiana Jones and the last Crusade. Let us discover the captivating story of the Christian knight George in the Dalmatian Brotherhood San Giorgio degli Schiavoni, we learn how he kills in Libya the dragon saving thus the princess. 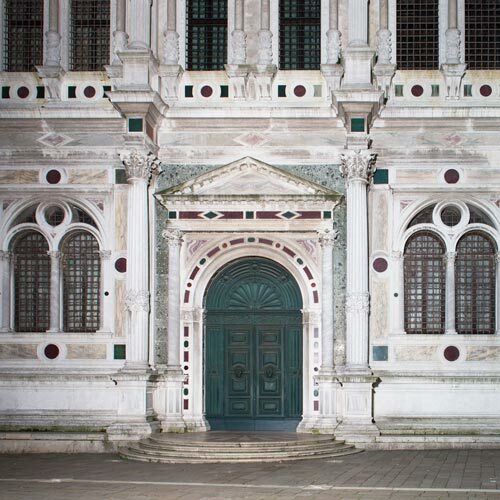 This Renaissance building contains a wonderful cycle of 9 paintings by early Renaissance painter Vittore Carpaccio. The most celebrated is the canvas of St. George riding his black horse with a lance and slaying the dragon, bones and skeletons scattered everywhere around in front of them, based on one of the ‘bestsellers’ of the time, the Legenda Aurea. From there we walk through a maze of quiet streets through the picturesque district of Castello including the campo San Francesco della Vigna and the campo SS. Giovanni e Paolo. We tour the northernmost part of Venice, the district of Cannaregio with its long airy symmetrically planned islands and peaceful canals where the majority of Venetians live nowadays. We start from Marco Polo’s house very close to the Rialto bridge, we pass by the Renaissance Miracoli church, by the Abbazia della Misericordia, enjoy from a small bay a glimpse of the lagoon and reach the lonely Gothic San Cristoforo Church known as Madonna dell’Orto after a statue originally located in a vegetable garden. This church contains some of the masterpieces (i.e. The Last Judgement and The Making of the Golden Calf) by Jacopo Tintoretto who lived in the parish and is also buried here together with his daughter. We continue to the Ghetto, the Jewish area, where we get a feeling for the history of this community, looking at the outside of the 5 synagogues, plaques on the walls and stumbling stones on the ground.